Amazon Gold - ARTE AMAZONIA provides a global voice through art for the indigenous cultures of the Amazon. the apocalyptic destruction of the rainforest in the pursuit of illegally mined gold. 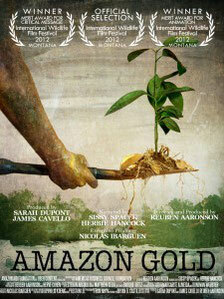 Narrated by Academy Award winners, Sissy Spacek and Herbie Hancock, Amazon Gold is the disturbing account of a clandestine journey bearing witness to the apocalyptic destruction of the rainforest in the pursuit of illegally mined gold. Narrated by Academy Award winners, Sissy Spacek and Herbie Hancock, Amazon Gold is the disturbing account of a clandestine journey that bears witness to the apocalyptic destruction of the rainforest in the pursuit of illegally mined gold. The result of the devastation will create consequences on a global scale. Ron Haviv and Donovan Webster, two journalists who normally cover war and human rights issues travel along Peru’s Madre de Dios River to reveal the savage unraveling of pristine rainforest. The men are guided by Peruvian environmental activist and biologist, Enrique Ortiz, who is uniquely qualified to point out the heedless exploitation of the land for minor gain. Director Reuben Aaronson utilizes his skill in Spanish to question local miners who are eager to scrape together enough money to start a business or feed their family, not realizing the consequences to their health and homeland. Vulnerable trees, over one thousand years old, as well as countless species of plants, animals and insects, both known and unknown, fall victim to the annihilation. An animated Agouti springs to life to tell the story of his ecosystem, as the only species to crack open the Brazil nut to repopulate the apex forest tree. The valuable Amazon rainforest is not only being stripped of life, but also forever poisoned with mercury, a by-product of the illegal mining practices. Left in the wake of almost surreal images of once extraordinary beauty turned into hellish wasteland, Amazon Gold reaffirms the right of the rainforest to exist as a repository of priceless biodiversity and not as the toxic remains of man’s greed for gold.